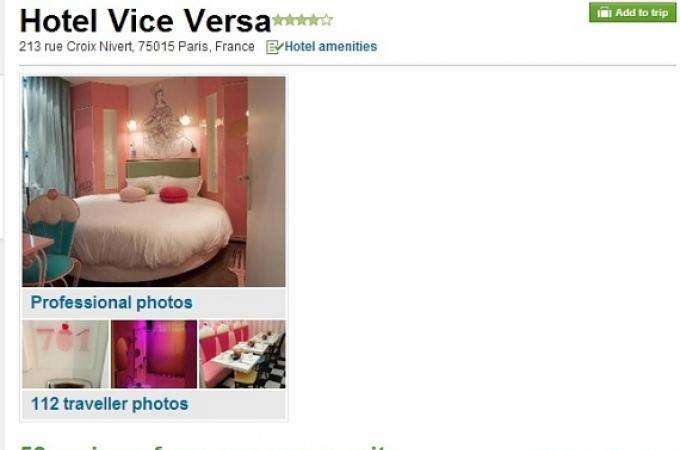 Vice Versa Hotel, Paris is truly a feast for the senses. The Seven Deadly Sins theme has been brilliantly conceived by the famous designer Chantal Thomass, and each floor represents a different sin. A truly inspired concept and much loved by guests who have given this fabulous, fun and friendly hotel the recognition it richly deserves with this high rating on Tripadvisor. Guest comments reflect the excellence and attention to detail which have made this wonderful haven in Paris such a success. Try the 6th floor if you're a couple' says Kader H, while lgsdias from Sao Paulo said 'Rooms are well sized for Paris standards and the entire decoration is brand new. Got the 'Colere'room with its 'My Baby Shot Me Down' theme' while 1oneUK chick from Oxnard, California noted that 'This hotel is very cheeky' and added 'Excellent stay here, don't miss it if you're in Paris'. This enchanting Paris boutique hotel truly is a delight for the senses. Beautifully decorated throughout, Chantal Thomass invites guests into a world of lighthearted whimsy and of course, sin. The inviting reception area is a wonderful interpretation of sin in cool, serene white, and a welcome oasis from the bustling Parisian streets. The hotel's location close to Paris Expo, Porte de Versailles and the metro allows guests to reach the main attractions, shopping and entertainment areas of the city within minutes. Rated as 'excellent' by previous guests, the hotel has much to offer. Individually decorated rooms, helpful and attentive staff, and even a hammam or steam room decorated with a 'Hell' theme, all add up to a fulfilling experience. Make your next stay in Paris a real pleasure at this highly rated 4 star hotel. Organise your trip with the Parisian Metro's interactive map.